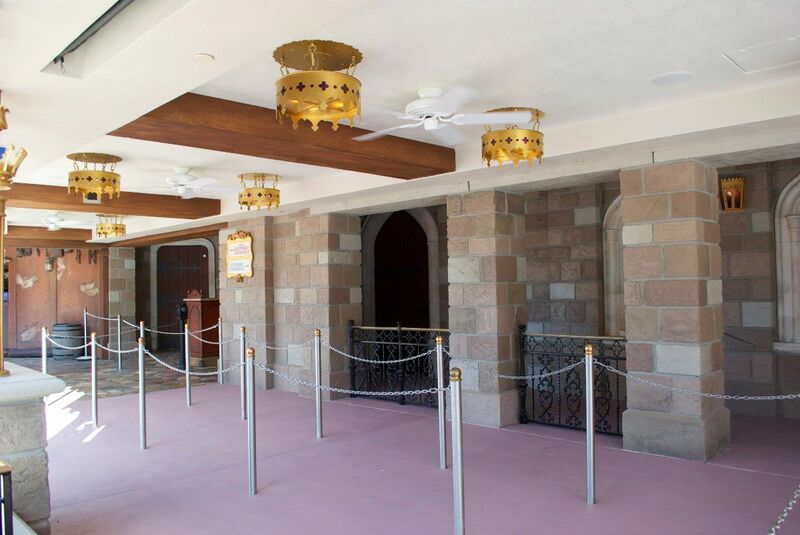 The Magic Kingdom’s newest meet and greet opened officially this week, adding another checkbox to the Fantasyland to-do list. Princess Fairytale Hall is a fully-themed Disney Princess meet and greet located just behind Cinderella Castle next to Sir Mickey’s. 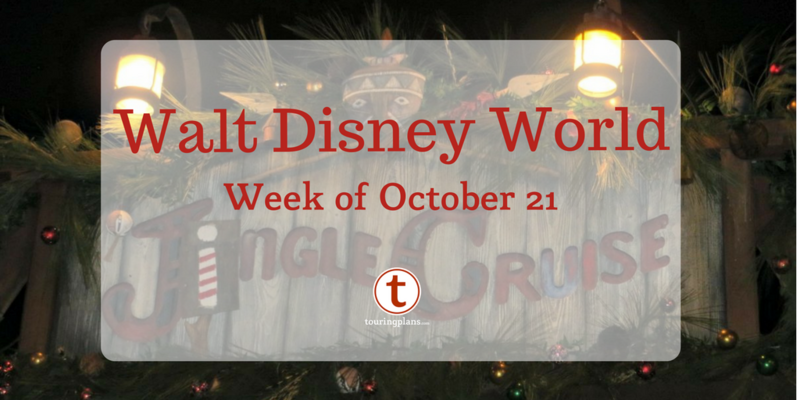 What do you need to know in order to get the most out of this new meet and greet location? First, Princess Fairytale Hall (PFH) is now the permanent home of two of your favorite princesses, Rapunzel and Cinderella. Both princesses meet daily from park open to closing. You can find out which princesses will be meeting and greeting on the daily Times Guide available at the park entrances and many retail locations, as well as at Guest Relations. 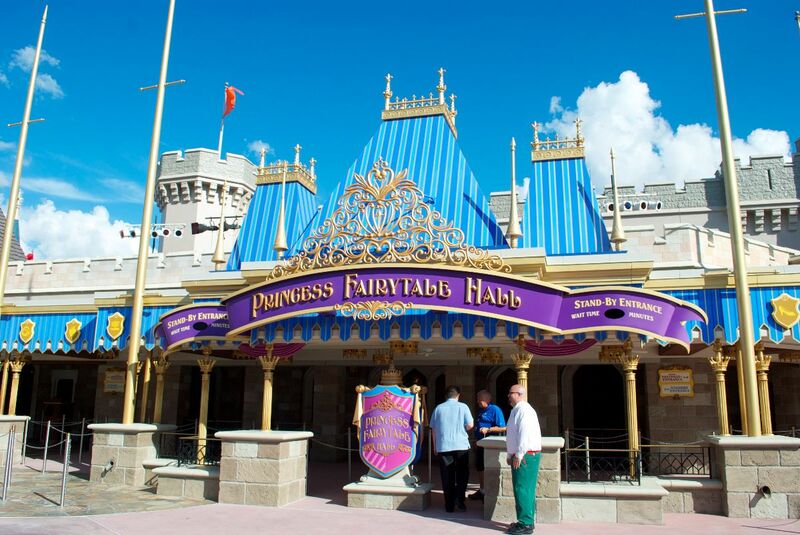 FastPass+ is available for Princess Fairytale Hall, with Cinderella and Rapunzel’s lines each requiring a separate pass. 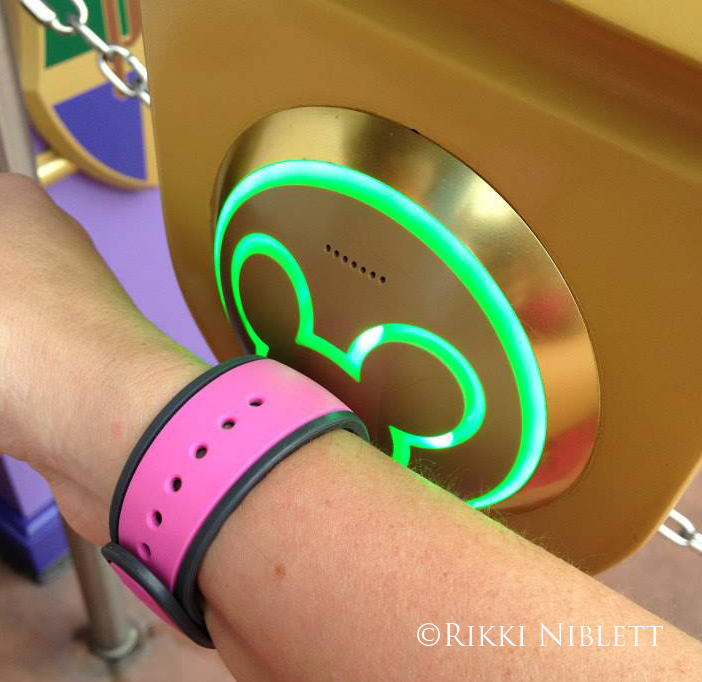 Guests may schedule FastPass+ using the My Disney Experience app on their phones or at park kiosks. On April 20, Princess Fairytale Hall will begin hosting Anna and Elsa from Disney’s Frozen. The girls will greet with another surprise princess in one room and Cinderella and Rapunzel will be moved to a room together. Fastpass+ will be available for meet and greets with these princesses beginning April 20, 2014. Given their popularity, it is certain that Anna and Elsa’s wait times will be some of the highest on property. 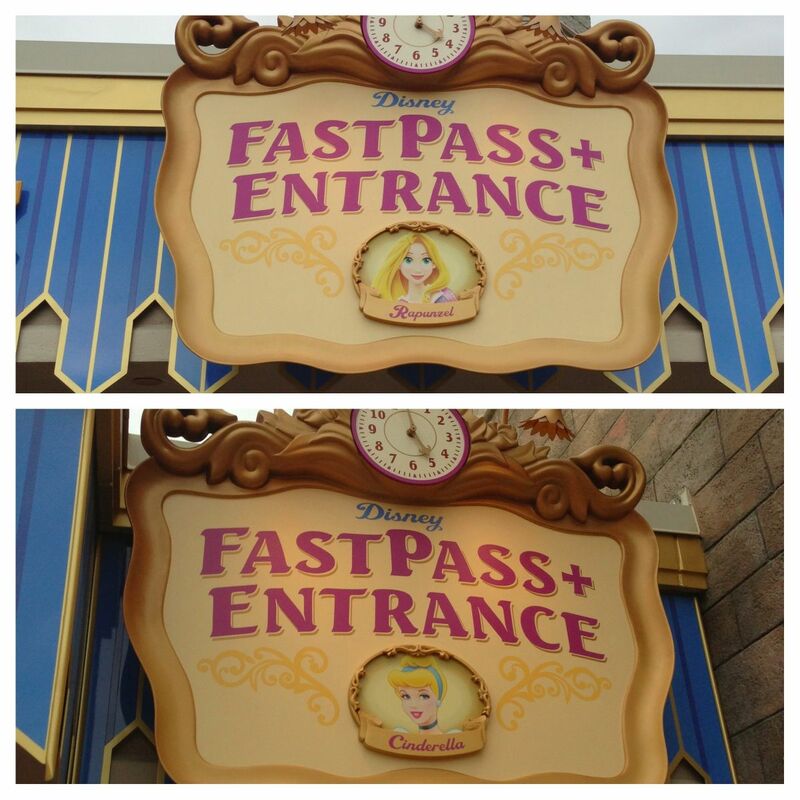 It’s recommended that you use Fastpass+ to see them. The queue lines are a combination of covered outdoor space and air-conditioned indoor space, which can be a relief in the heat. They are somewhat short, however, and it wouldn’t surprise me to see standby lines stretch out into the uncovered walkway during peak season. The outdoor queue space complete with (yes!) ceiling fans. 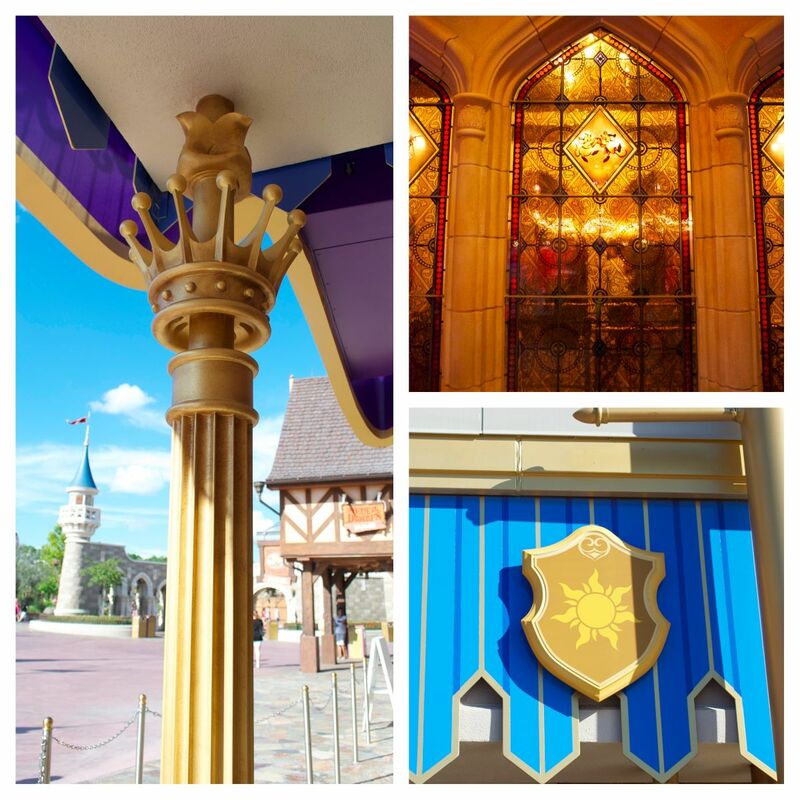 Be sure to check out the details all around the building including the very royal scrollwork, the stained glass windows with Cinderella’s animal friends, and the shields adorned with each princess’s symbol that hang around the marquee. The Imagineers went to great lengths to make this venue entertaining to look at. 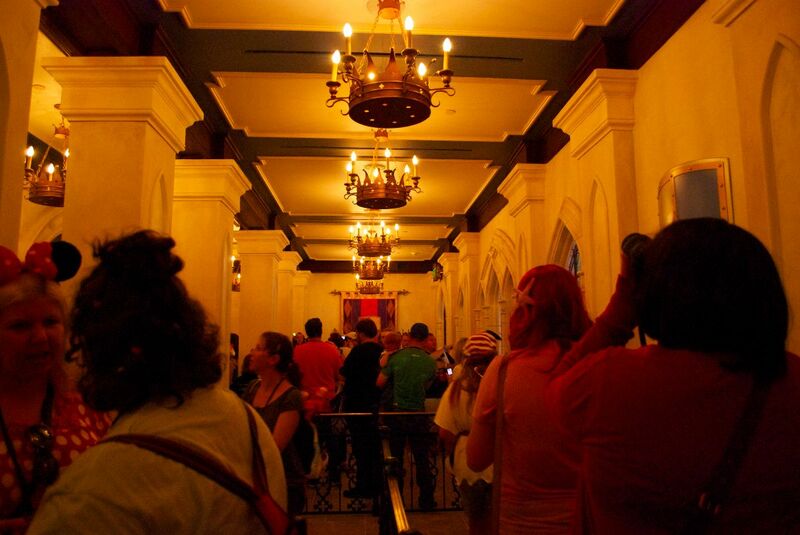 Once inside Princess Fairytale Hall you’ll wait in a corridor filled with tapestries and themed lighting. Because the only windows lead to the covered waiting area outside, the interior corridors are a little dark. There’s also not a ton to see at this point in the line, which may make for some squirmy kids if the wait is long. 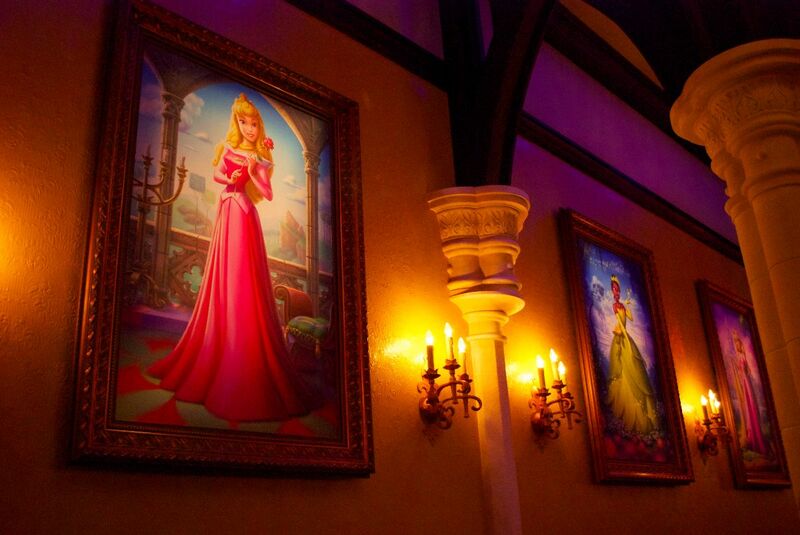 If you are in the standby line, this interior hallway takes you to the Portrait Hall, a gorgeous room outfitted with six nearly-life-sized princess portraits of Aurora, Tiana, Rapunzel, Mulan, Jasmine, and Snow White. 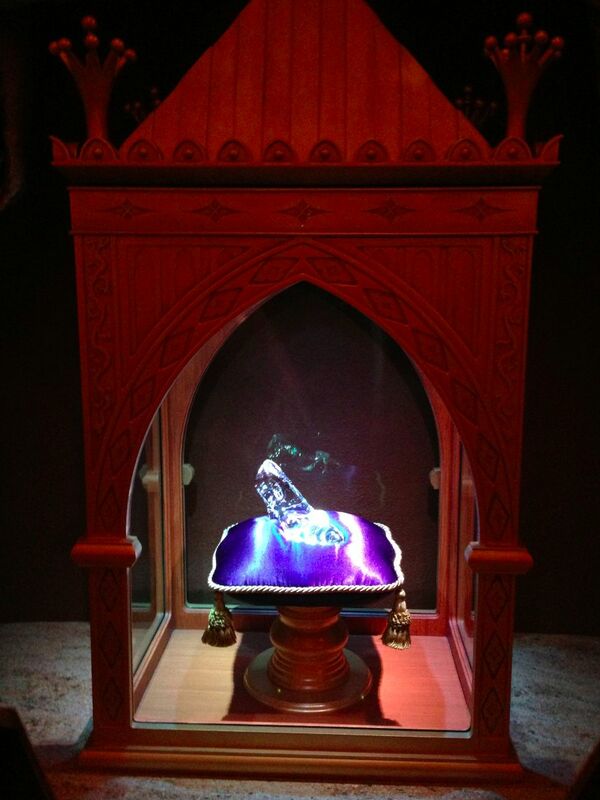 This room also houses Cinderella’s glass slipper as a special surprise. It should be noted here that if you choose to use FastPass+, you will not go through the Portrait Hall, but instead will go directly to the meet and greet rooms. While this is faster, it may detract from the overall experience. Have your camera ready because you don’t get much time to see the slipper, as it’s just at the end of the line before you’re shown to your meet and greet room. 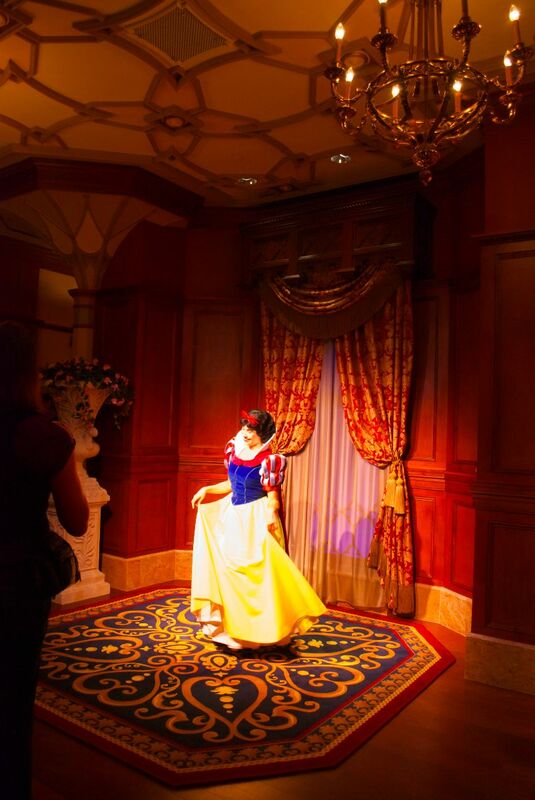 From that point, Princess Fairytale Hall works like a standard meet and greet. 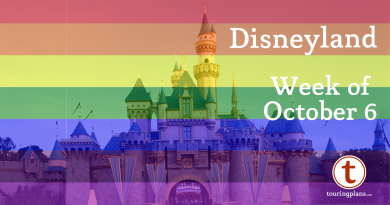 You’ll see Cinderella or Rapunzel and their surprise princess friends and will be able to chat with them, as well as get pictures and autographs. 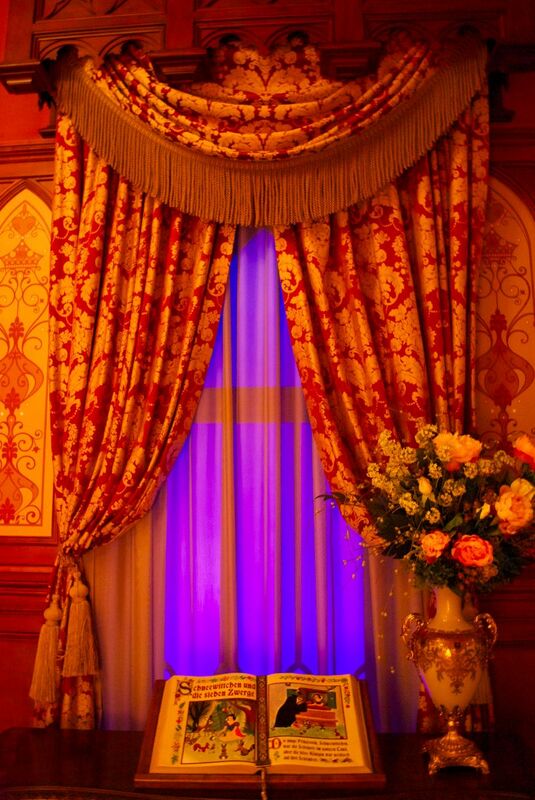 The rooms are luxuriously outfitted from the carpets to the drapes to the furnishings, and storybooks are a common theme in the meet and greet rooms. Snow White’s storybook is permanently placed as a nod to the ride that formerly occupied the space where the meet and greet now resides. You may notice that many of the photos I took have a red cast to them. While the lighting in Princess Fairytale Hall is lovely to look at, in many places it is similar to theater lighting (especially the super-bright spotlights on each princess) and is thus not great for photography. I was shooting with a Nikon D60 DSLR and no flash. Be sure to accept the PhotoPass cards that the photographers offer you in case your photos don’t turn out like you want them to, or, in the alternative, adjust your white balance when possible. External flashes are also helpful. Last, but definitely not least, if you’re concerned about being filtered through a shopping area upon exiting the meet and greet, choose the line on the left side of PFH, which does not empty into a merchandise location. The right side funnels you into Sir Mickey’s when you are done. **This article was updated on March 23, 2014, to reflect changes made to character schedules at PFH. My girls will love this, but our issue will be that our seven year old’s favorite princess is Cinderella and our five year old’s favorite is Rapunzel. Of course, they both love all the princesses, but when we finally get to experience, it will be interesting to see how we decide which princess to visit first! Beth, thanks much for your feedback! I think it won’t be too hard to decide, as Cinderella’s wait has been consistently much shorter than Rapunzel’s over the past couple of days and I don’t expect that to change. I would suggest getting in the standby line for Cinderella so that your girls can see the Portrait Hall and Cindy’s glass slipper, then Fastpassing Rapunzel. You’ll get the whole experience in less time. Have a great trip! Thanks for the tip!! I will definitely use that advice when we are there. This looks so nice! In 2012 we waited 70 minutes to see Rapunzel before she moved into the theater. I am so relieved that she will have fastpass availability now! At first I was bummed when I learned that there would be two separate lines, but then I remember that we always eat at Cinderlla’s Royal table and get a great picture with Cinderella and meet and great moments with 3 other princesses, so I’m okay with it now. However, when you say that the times guide says that it will tell you which ‘friend’ is meeting, does that mean that it’ll say “Snow White meeting with Rapunzel, Ariel meeting with Cinderella”? I hate that we don’t know ahead of time which fairy will be meeting with Tinkerbell, so I hope this is different and actually names the princess. Hi, Rosalie! The Times guide will list the actual princess friend’s name. Currently Snow White meets with Rapunzel and Aurora with Cinderella. As an aside, Belle and Ariel won’t ever be options for Princess Fairytale Hall, as they are both already in other venues (Enchanted Tales with Belle and Ariel’s Grotto) at the Magic Kingdom. Thank you so much for reading and I hope you and your family have a wonderful next trip! I was in Magic Kingdom yesterday (Thurs.). Magic Kingdom seemed a little crowded. I don’t know what the crowd numbers were. We did Princess Fairytale Hall 4 times, twice on each side. The first time was about 10am on the Rapunzel side and the wait was about 40 minutes. The next 3 were via Fastpass. Even at 8pm the Rapunzel side was a 50-minute wait, while the Cinderella side was very short. Cast members told us that the day before, Rapunzel line was 120 minutes. We had great interactions with all the princesses. It was Cinderella and Aurora, and Snow White and Rapunzel on the other side. I asked Rapunzel if she would wrap her magic hair around my blisters and sing her pretty song to make my feet feel better. I think that amused her. Anyway, I think it’s a great space and is going to be a hit! I would do Cinderella via standby to go through the central portrait hall. If you use Fastpass, you use side corridors and don’t really see the portrait hall except when you are ushered in for your audience with the princesses. Thanks for the feedback, Rae. Sounds like you really made the most of the Princess Fairytale Hall experience. Rapunzel’s line was definitely getting a lot more people than Cinderella’s, and I would imagine that will continue to be the case. She’s pretty popular! I agree that yesterday seemed crowded. Hope your vacation continues to be awesome! Thanks for the info (especially the note on the FastPasses)! While I love Rapunzel & Cinderella, on my next trip (October 28 – November 2) I’m most interested in meeting Tiana. What is the best way to go about seeing her? Hi, Jenn. I’m glad the information was helpful! Tiana and Naveen meet and greet daily (weather permitting) in a gazebo behind Ye Olde Christmas Shoppe (Liberty Square). They’re out for about 45 minutes at a time with breaks between. Their times will be in your Magic Kingdom Times Guide daily. Have a great time! Thanks Morgan! I wondered if that was still their location. So does anyone know which line is Frozen and which is Rapunzel/Cinderella? If I am going to attempt the crazy parent/kid race to see Anna and Elsa, it would be helpful to know which side is their queue. Am I really going to show up at the park at 7 a.m. to be at the front of the pack at 9 a.m.? The jury is still out on that one. I keep trying for Fastpass + but all are still taken.